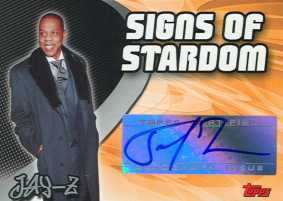 Topps announces that Hip Hop icon Shawn "Jay-Z" Carter has signed all 50 of his 2005-06 Topps Basketball Cards and that they are ready for delivery to collectors and fans holding redemption cards. Jay-Z has also finished signing cards for remaining 2005-06 Topps Basketball products including the upcoming Topps Big Game Collection. Carmen Electra, Shannon Elizabeth, Christie Brinkley and Jenny McCarthy join Jay-Z as part of the Topps Celebrity program featuring Autographs, Relics and Rookie Cards.